Welcome to Things Are Beautiful, Inc.
Click submit your logo or artwork for a free estimate. The embroidery process uses the supplied graphic image as a backdrop for “on screen” digitizing. Digitizing is the manual conversion of the artwork into an embroidery machine format where a computerized embroidery machine will then stitch out the digitized design. The quality of the final product will depend on the quality of the original artwork, the quality of the machinery and material used in the embroidery process, but most importantly, the beauty of the eventual embroidered item will primarily depend on the digitizer’s skillful interpretation and digitization of the artwork. We at Things Are Beautiful specialize in such artwork digitization and in making your embroidered logo as beautiful as they can be. The screen printing process uses the supplied artwork for the exact reproduction of the graphic image, no human interpretation is required. However, if your available artwork is a little less than perfect, do not worry, we can help you to clean up and improve your artwork and make things perfect for you. 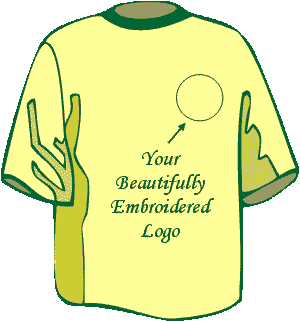 The embroidery process will produce a great quality logo that will last for a long time even after repeated laundering. The screen printing process allows for the printing of a large size image and is more cost efficient for large run projects. Click submit your logo or artwork for a free estimate. Chick here for artwork preparation and digital imaging info.